Free for a limited time! Receive a 2 pack of Cyclo ProGuard Orbital Backing Plates AND a Cyclo apron when you purchase this Cyclo Orbital Polisher. A $59.98 value! 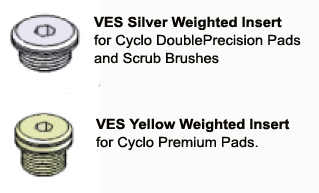 For DoublePrecision Pads and Cyclo Brushes, use the Silver Weighted Inserts, also available below. here to read more about VES. 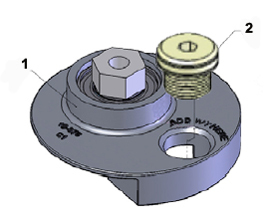 I have had a cyclo orbiter for over 20 years until I broke it by overtightening and freezing a bolt. Rather than send it in for repair I treated myself to a new model 5. Same beautiful unit, but this one is better balanced. I had some questions on the new blue head velcro attachment and my questions were addressed and answered immediately. Awesome company both in product and services! 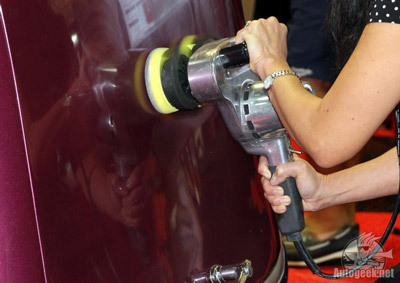 I have been using a large rotary polisher for years and it is always a tense situation. The thing is heavy, hard to hold onto and you can burn through the paint in an instant. The Cyclo is AMAZING. It is so well balance and gentle but very effective. It is actually now fun to polish my cars. This is the only way to go. Spend it right and spend it once. You will never use another machine. ConsThey could use better electric cord. The type they are using is cheaper plastic and stiff. Easy enough to replace but for this money they could do better. If not for this it would be a five star. 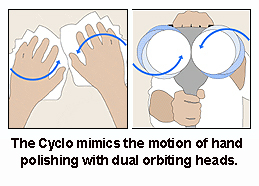 I have been using a Cyclo polisher for years. It is by far the best polisher on the market. I would highly recommend it to any "auto-geek." Smooth! That's how I think of using the Cyclo to polish. It polishes paint much better than lesser DA polishers and is quieter and smoother while doing it. Your hands don't get that "tingling" that you get when using a DA and that alone makes it worth the extra $$.